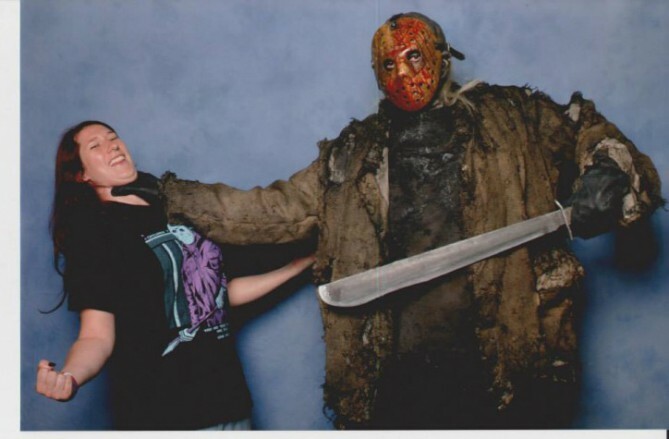 Horror guests on the convention scene in the UK have always been a little hard to come by, especially compared to all the Horror specific conventions that take place in the states. So, it was a great surprise to see Robert England added to London Film and Comic Con this year. Sure, among the small crowd of horror guests that do come to the UK, he is one of the regulars. However, for this appearance he was going to be in Freddy Krueger makeup… applied by Robert Kurtzman, nonetheless. To say I was excited to see this coming to the UK was an understatement. It was very unexpected, especially as Robert (Englund) had done the same thing at a U.S convention last year, where it was billed as the only time he would ever be doing it. So, I went ahead and bought a bought a diamond pass to guarantee my spot with Freddy himself. Fast forward 6 months and the London Film and Comic Con is upon us. The show itself has become quite a huge draw. Saturday and Sunday were completely sold out, with only a small number of tickets still available for Friday. I entered the show at around 2:30 on Friday. The queue to get in was relatively small as the Con had opened its doors at 1pm. I had no plans for Friday except for a horror talk in the early evening, so today was the day to check out the booths and try to get some autographs. Inside, the Con was heaving. Easily the busiest convention I have ever been to, but not surprising considering the calibre of guests. UK conventions are always full of Star Wars and Doctor Who guests, and more recently Game of Thrones guests. And this one was no exception, with plenty of choice from all 3. However, what really set this year apart was the inclusion of “big” guests such as Michael J Fox and Sigourney Weaver. First port of call was the vendor booths, and what a lot of them there were! 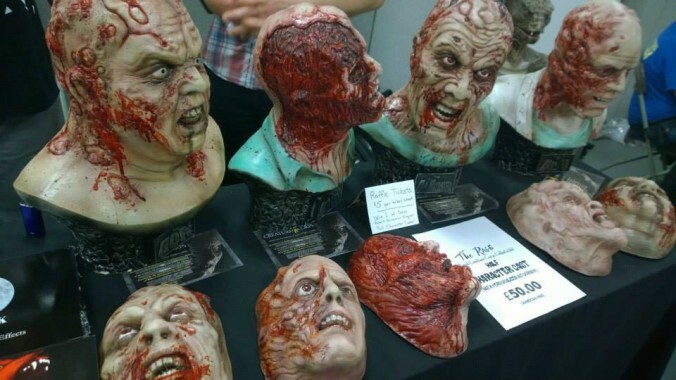 Like I said before, horror isn’t huge in the UK, but there was a fair amount of horror related merch amongst the stands. I was happy to find the Cellar Dweller/Catacombs blu-ray at a reasonable price almost instantly, which was cool. After checking out the stands, I decided it was time to grab some of our sought after autographs. I say “our“, as I was with my wife. Niki. who is also a horror fan. Fighting the crowds was almost as hard as actually finding the guests you wanted to see. There were so many present, and the Con was spread over a whopping 4 levels. We passed many interesting guests, such as William Forsythe, Jennifer Rubin, and Sherilyn Fenn on the way until we found Darren Lynn Bousman. He was our “number one” choice today as I was carrying around a framed Repo! poster to which we wanted his auto added. Darren was a really nice guy! He was more than happy to talk about Repo! and The Devil’s Carnival, and I could tell that he had a real love for the genre. Just a few guests down from Darren was Robert Kurtzman, our next autograph choice, and again another really nice guy. We talked a while about several of the films he had worked on, including Troll, which I found out was his first gig in effects. He worked on the chrysalis that gave birth to Sonny Bono‘s troll creature! And Robert was particularly interested in the Blu-ray copy of The Rage that I’d brought for him to sign. Titled Zombie Rage as it’s a German copy, he had no idea it had a title change and even took a pic. He said that he had casts from the movie which he was going to be selling on his table, but they were currently held up in customs and would be there the next day. As we left his table, I knew that I was going to want one, and my wallet was going to be hurting even more come the end of the weekend. Our last autograph of the day came from Sean Gunn, probably best known for his part in Guardians of the Galaxy, especially if the choice of pictures at his table was anything to go by! Sean was again really nice and had a good laugh when I showed him my Blu-ray of Tromeo and Juliet which I got him to sign. He said he had a blast playing Sammy Capulet even though he only got paid about $100 for his part. Our final port of call for the day was the main stage, where we went to sit in on the Horror talk. We got there a little early and managed to catch the Gremlins talk as well (with Zach Galligan and Frances Lee McCain) which was a bonus. Present at the Horror talk were Tom Savini, Ken Kirzinger, Darren Lynn Bousman and J. Larose. The talk was very entertaining and informative. Again, one thing that came across was how much of a horror fan Bousman really is, as he told Savini more than once how he grew up with his work. So, day one was down and it was on to Saturday. I had a photo shoot booked with Sigourney Weaver at 9:30, so I left Niki at the hotel and joined the already huge queue for entry to the Con at 7:30. Although it was a long wait until I walked through the doors at 9:15, I was kept entertained by some really good (and some not-so-good) cosplay in the crowds. 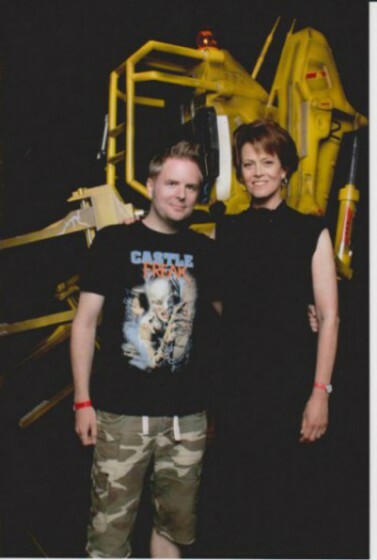 Sigourney was lovely, and even mentioned the Castle Freak shirt I was wearing as we posed in front of a Aliens Power loader for the pic. I met back up with Niki afterwards and we went around and grabbed a few more autos from some non-horror guests, whilst also stopping by again to chat with Bousman and Kurtzman throughout the day. Did I mention before how great these 2 were?? Next up was Ken Kirzinger, yet again another really nice guy. We were a little taken back by how tall he really is in the flesh. Part of my diamond pass for Robert Englund included a free autograph, so we went to find him next, passing Neve Campbell’s massive queue on the way. Robert had an even larger queue when we arrived. Even with the diamond pass it took a good 45 mins to see him. He was as nice as ever and happily signed the Freddy vs Jason page of our Friday 13th boxset. The rest of Saturday was spent looking at the stands, or with some other non horror guests. And so we reached Sunday, our final day. It was another 7:30 start in the queue. Niki headed off for a photo shoot and I attended the Robert England/Robert Kurtzman talk. On the way I passed Robert Kurtzman’s table and couldn’t resist picking up one of the half head casts from The Rage which he duly signed for me. The talk itself was very good. Lots of interesting info and many funny stories were told. 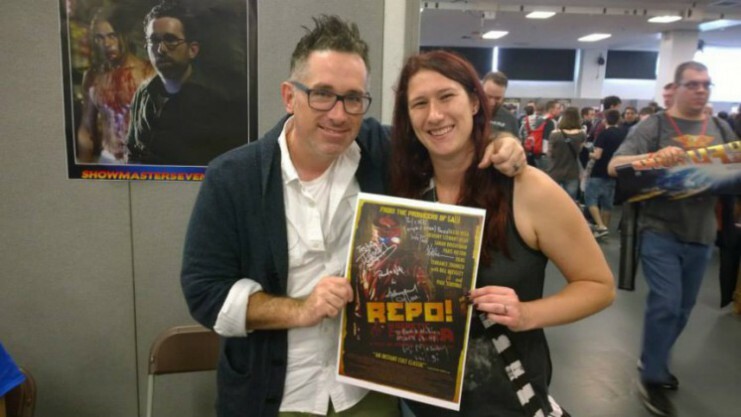 After that we used the remaining hours to chill and chat with Darren Lynn Bousman some more. We also took the time to talk with J Larose and added his signature to our growing collection on the Repo! Poster. And then it was on to the grand finale for me, the Freddy Krueger photo shoot! I got to the photo area to be confronted with what can only be described as “chaos”. Hundreds of people were standing around waiting for Freddy, blocking the walkways and vendor tables in that area. Thankfully, the organizers began to call people through in batches of 50. As my pass was number 12, I went in the first group. I can’t really describe the feeling of seeing Freddy standing in the same room as me. Even though he wasn’t wearing the sweatshirt, it didn’t detract from the experience. He wise cracking and pulling poses with everyone whilst security watched on.It’s as though you were on the set of a new Nightmare flick! Watching Robert do his thing as “Freddy” was a massive moment for me, and worth the price tag alone. 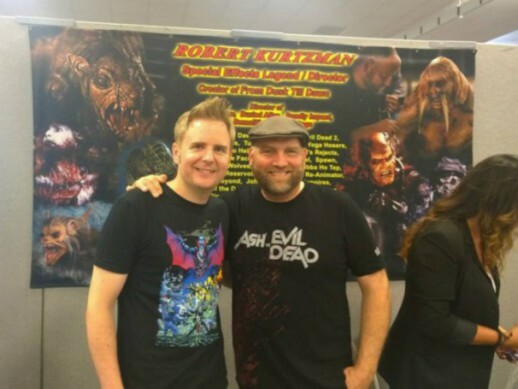 I got my picture and was able to shake hands with Robert Kurtzman, who was also present at the shoot, one last time. 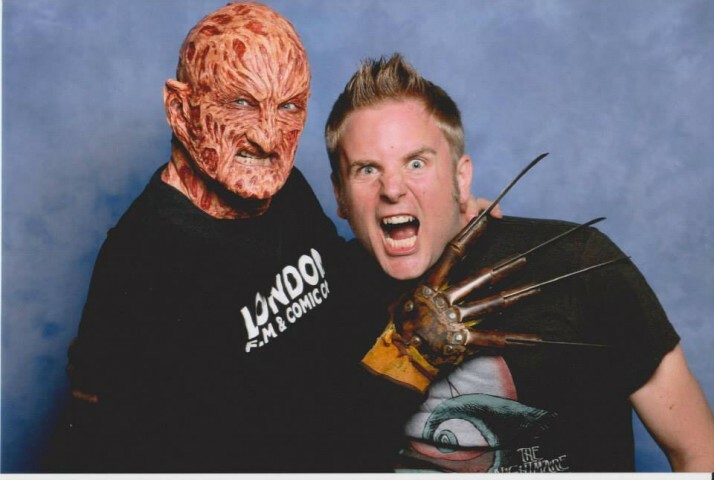 And that was my experience as a horror fan at the London Film and Comic Con! Overall a fantastic weekend and I will now hope and wait to see if they will bring in more horror guests in the future.